The blog took a shot at the long side of the December KC/Chicago wheat spread at the start of September and got knocked at when it crashed to new contract lows in the second half of October. We instituted reentry parameters to go back in on a close above the declining 75-day Moving Average. Yesterday the December spread closed at a new contract low of -29 cents (premium CBOT wheat). This puts it right at price support on the nearest-futures chart between the July low of -28 3/4 cents and the August low of -29 cents. Will the third time here be the charm? If not, the spread may not find support again until the September 2007 capitulation low of -61 1/2 cents. Yikes! We’re clueless as to whether or not the bottom is right here. Therefore, we are waiting for a sign that the trend is changing before we hop back in on the long side. No sense in going against the grain! With the First Notice Day for the December grain contracts coming up at the end of the month, it might not be a bad idea to go ahead and start stalking the March spread for the reentry trade. Let’s take a look at this spring spread. 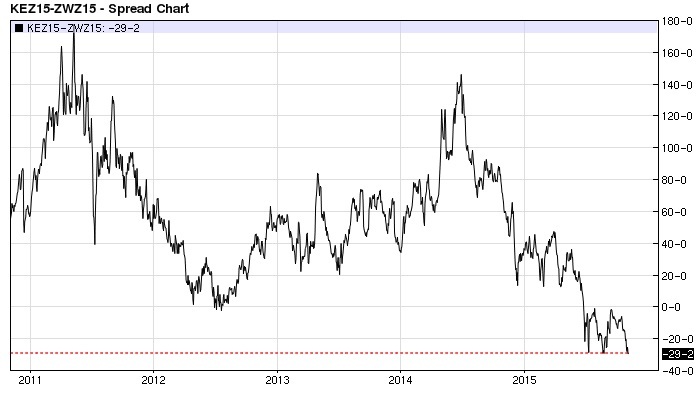 The March KC/Chicago wheat spread posted a new contract low of -16 1/4 cents yesterday. Price support is located about another 13 cents lower on the nearest-futures chart. That’s where the December spread is at right now. If the December spread continues to plunge, it will likely drag the March spread into the abyss with it. The declining 75-day Moving Average was our technical line in the sand for the reentry on the December spread. It will serve as the same reentry parameter for the March spread as well. 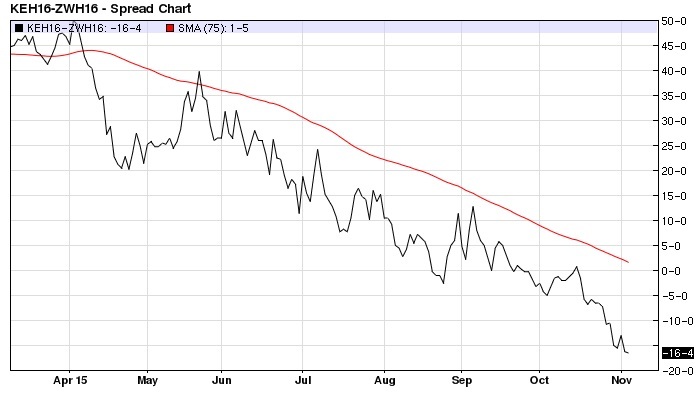 The March KC/Chicago wheat spread has not closed above the 75-day MA since May 21st and the September bounce never even tagged it. By Friday, the 75-day MA should be close to the October price peak. This price peak is noteworthy for two reasons. First, the October 15th high is the only place in the last five weeks that the March Kansas City wheat closed at a premium over the March Chicago wheat (by a mere three-quarters of a cent). The ‘even money’ mark is a psychological inflection point for the KC/Chicago wheat spread. Second, the March KC/Chicago wheat spread has only surpassed a prior month’s high one time since April. The spread has made lower monthly highs in five of the last six months and lower monthly lows in nine of the last ten months. This is bearish price structure. A close above the 75-day MA for the first time since May could signal a bullish trend change and a breakout above a prior month’s high would alter the price structure of the downtrend and confirm the trend change. Combined with the fact that any inversion in the KC/Chicago wheat spread has historically reversed at some point, it’s seems like using this change in price structure is a good bet that the inversion may finally be coming to an end. Cancel the reentry order in the December KC/Chicago wheat spread. Work a new hypothetical order to buy one March Kansas City wheat contract and simultaneously sell one March Chicago wheat contract if the spread closes above the declining 75-day Moving Average. If filled, risk a two-day close of three cents below the contract low that precedes the entry.